I’m excited to be able to share my Christmas decorations with you this year! We had only been in our new-to-house for a couple of months when Christmas rolled around last year and we were in the midst of a total remodel, so I didn’t have time to do much more than decorate a rustic Christmas tree and come up with simple and cute rustic gift wrap for our presents. I’m doing my best to make up for it this year though. I started in my breakfast area by replacing the gallery wall above my kitchen sideboard with rustic, farmhouse style open shelves and I am in love! In case this your first time visiting, this is what the same area looked like when it was decorated it for fall. I loved the gallery wall, but once we started making some other changes in the breakfast area (that I’ll show to you when they’re complete), I realized that this wall needed something different. 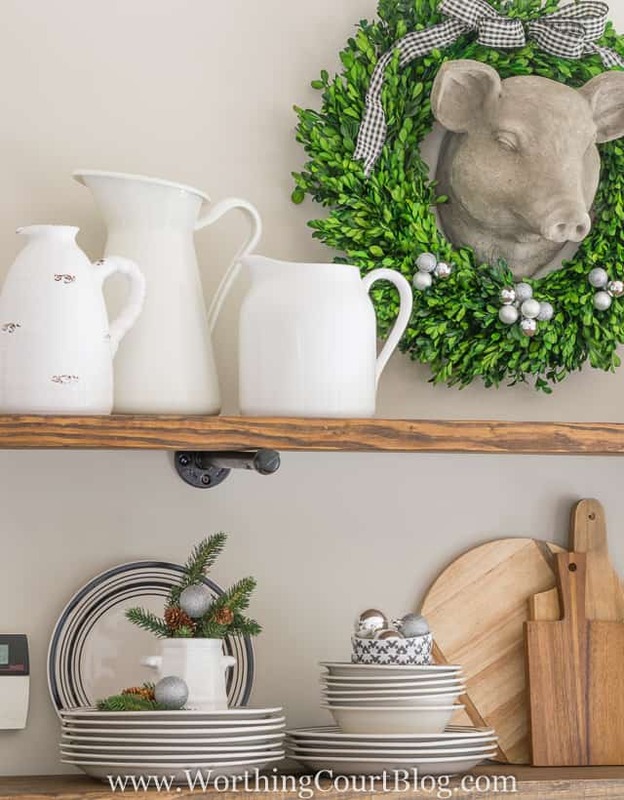 The shelves give the wall some much needed dimension and allow me to display some of my favorite farmhouse accessories. Even though the gallery wall went away, I had to keep Mr. Wilbur, so he can keep a close watch over everything. Ha! 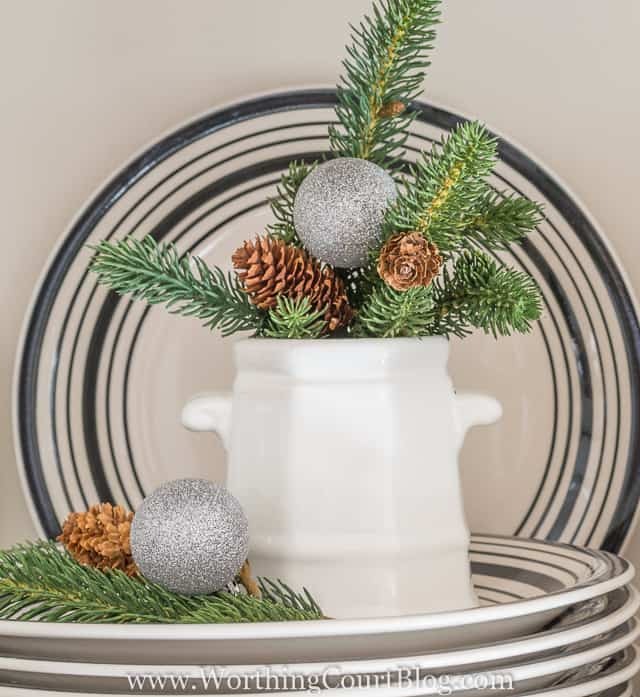 The stacked dishes and bowls with black rings along with the mugs on the mug tree all came from the Dollar Tree and were a such an affordable way to add some style to the shelves. I’ve only recently started collecting cutting boards and am on the lookout for a large rectangular one to go behind the circular shaped one. And remember the 10 Minute Rustic Luxe Christmas Lantern tutorial that I shared with you a few days ago? Well, I stole the pinecones out of it because I knew they’d be perfect on my shelves for Christmas. A cute little wagon filled with a mini Christmas tree sits alongside my vintagey looking measuring cup. Some faux greenery fills a thrift store crock. A few of the white pitchers in my collection. Oh, and how about that farmhouse alarm panel – see it? Ha! I started with the decorations on the surface of the sideboard by simply laying a frosted faux pine garland across the back. And to remind us all of what a joyous occasion Christmas is, I added wooden letters that are held in place with Command Strips. …and a glitter Christmas house with some cutey patootey Christmas trees are nestled in among the garland. I’m so glad that you stopped by today! I’d love to connect with you over on Instagram and Pinterest! Now, make sure you check out all of the other inspiration for today and follow along for the rest of the week. Merry Christmas, y’all! Wilbur has some fine company on the shelves! He’s probably in hog heaven seeing Santa! Hehe! Love your new shelves and every detail you’ve placed on them! Thank you, Jane. It was hard to style them, but lots of fun too! That looks beautiful! Those shelves are just awesome! Thank you, Bee. Merry Christmas! Your shelves look amazing and I love every little detail! So, so pretty and perfect for the holidays. So happy to be touring with you today! Thank you, Julie. This has been an amazing tour, that’s for sure! LOVE your shelf display! 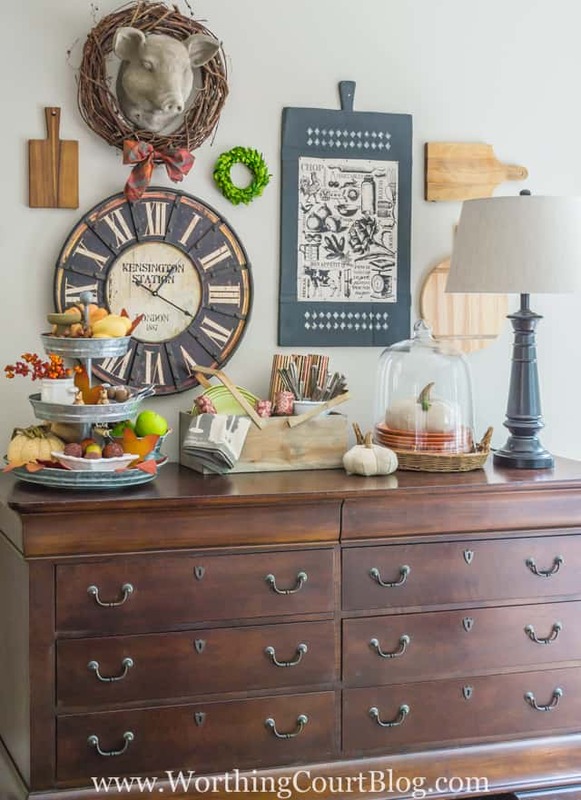 All the touches are lovely – and I love the shelves themselves (yes, I know that rhymes)! Thank you so much for participating in this year’s HFTH tour!! Thanks so much for your talent and sharing your beautiful style. Thank you, ladybug. I’m sooo glad to have them up in place of the gallery wall. It makes such a difference in this room. 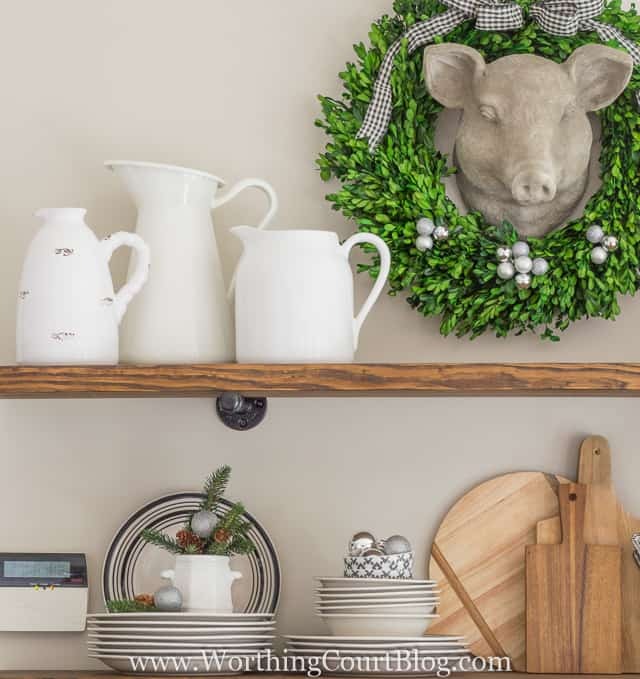 Can’t wait to share the rest of my Christmas kitchen during your All Through The House tour this coming week! This is absolutely stunning! I love everything about it. 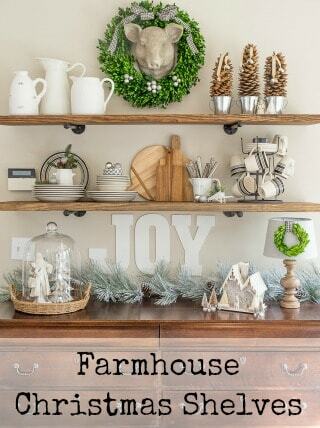 The shelves are perfect and I love the way you decorated it all for Christmas. I would have a hard time taking it all down after Christmas because it looks so pretty! It is fun touring with you this week! Thank you, Lindsay! I do struggle with that – when I get something just the way I want it, I don’t every want to change! Maybe I can switch out just a couple of things and keep it most of it the same for the winter. Your shelves are just perfect… love how you’ve stacked things and the greenery… so pretty! Thank you, Vanessa. Wish I could have gotten a better photo of Santa, but I’m still struggling with learning how to photograph through glass. Those reflections are a killer! oh suzy, it is just gorgeous…Wilbur too!! your photos are so pretty. Happy Holidays! Thank you, Laura. A very merry to you too! So pretty! Those shelves are the perfect fit, and I love all the bits and pieces you’ve added in. I love your new shelves! They are decorated so beautifully! I love all the special little touches you have. The pinecone trees are one of my favorite. Can’t wait to see the rest of your home! Thank you, Leanne! I’m so far behind with my decorating! Those pinecone trees are ridiculously easy, but are one of my fave things on the shelves. Suzy, your shelves are beautiful! So many unique and special touches. Where did you find that tiny wreath? It is so cute! Wilbur seems to enjoy his new necklace, too! Beautiful! Did you make the shelves or buy them? Love them and would love to find some! Hi Lisa. I made the shelves myself. Super easy. I wanted beefy shelves instead of thin ones, so I went to a local building supply (not Lowes or Home Depot) and purchased a board that was 12″ wide x 120″ long x 2″ thick. They cut it in half for me so that I could haul it in my car. I gave the boards a good sanding and then added stain to them. That’s it – I didn’t seal them or anything. Oh my goodness, Suzy … I am dying over your shelves! I truly love everything about them! The Santa and deer are so darn cute … and that pig! I am mad about pigs so I think he’s my favorite part! I truly hope imitation is the sincerest form of flattery … because I am totally copying your ideas here! Happy Holidays! Awww….you’re too sweet Kimberly. Thank you! A very merry to you as well! Your shelf display is gorgeous! Your personal touches and style are impeccable. You can send your cute little piggy our way…he’s adorable! Merry Christmas! Thank you! I’m pretty partial to Mr. Wilbur myself! Merry Christmas to you both! Love your shelves and the way you’ve decorated them. Looks great! Beautiful! I can’t believe those dishes are from the Dollar Tree! Thank you, Melissa! I went into the Dollar Tree looking for plain white dishes and there they were. I love them too! Oh GF I love your new shelves! I know this was your original vision for the space and they are perfect! I particularly love the brackets!!! Thank you, GF! Now you just need to come over and let’s drink a cup of hot cocoa together. 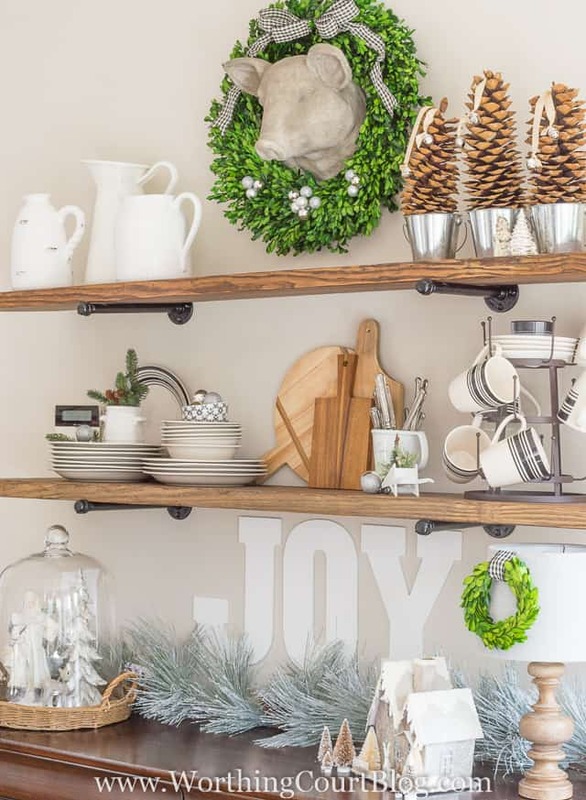 Your new shelving is so beautiful and I love the way you’ve decked them out for the holidays! You’re so sweet, Donnamae – thank you! Great look! 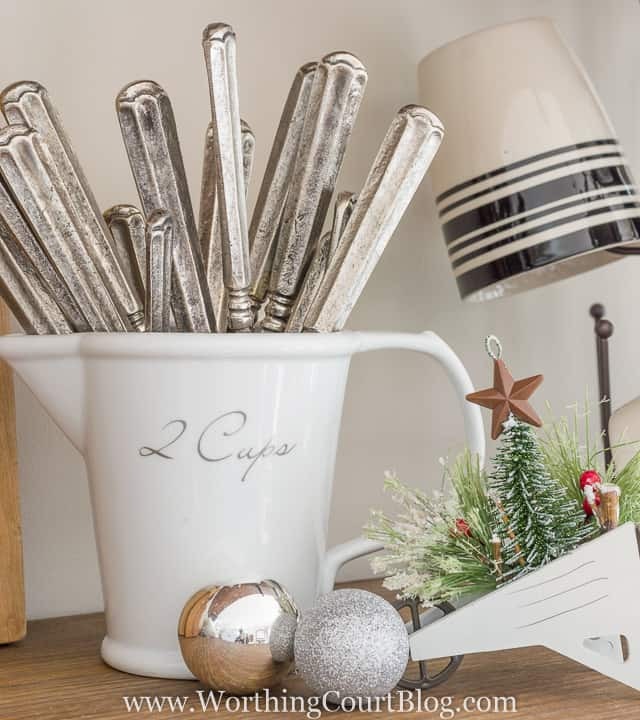 I love the mix of Christmas decora among the kitchen items and all the white is really classy. The new shelves are perfect for that spot. 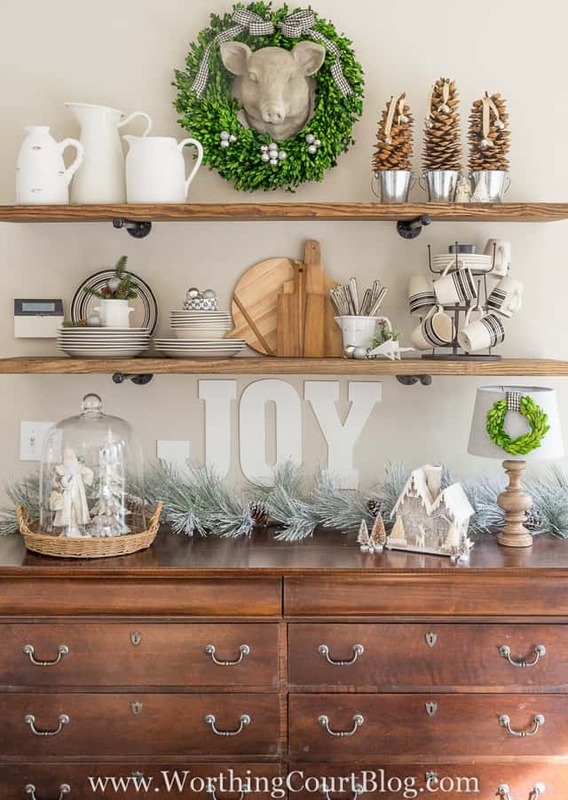 Love, love, love your shelves and your beautiful Christmas decor. Thank you so much, Marty. I hope you had a wonderful Christmas! Love the shelves and I just love the thoughtful display. So clean and interesting. Thank you, Laura. So glad I was able to inspire you! I love the shelves!! will you be sharing how you made them? So glad you like my shelves! Sadly, I was a bad blogger and didn’t take any photos along the way to put together a how-to post. They were very simple to do though. If you’d like to give them a try and need any help, shoot me an email and I’ll be glad to explain how I did it. oooh i love these shelves- they look perfect! and on this post the header scrolled away- not sure why the other didn’t. 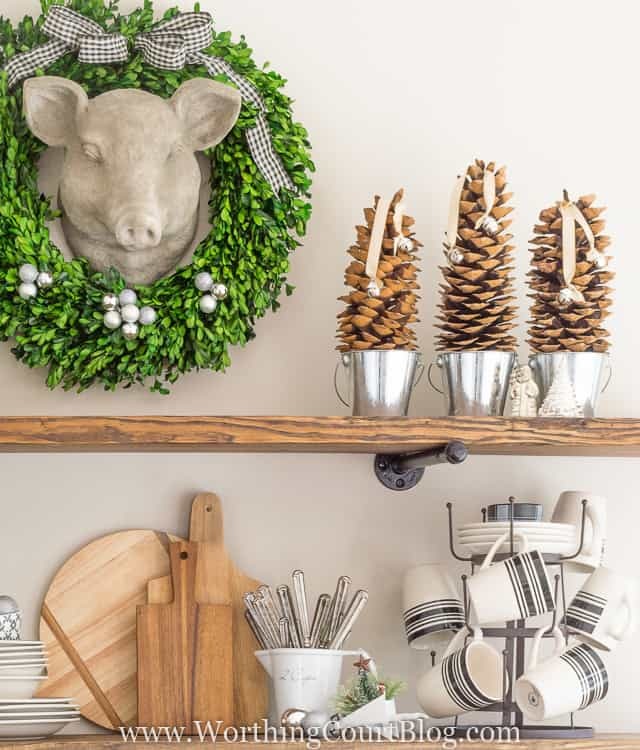 I love how you added the wreath and the way you displayed your wooden boards the most! Thank you for joining the 12 days of Christmas Blogger Tour Link Party! Merry Christmas! Hi Carey. So glad you like my shelves! The brackets are made from plumbing parts that I purchased at Lowes. The brackets are secured to the wall with screws, but we made sure to get at least two of the screws into a stud. The boards aren’t secured to anything – they’re just laying on top of the brackets. They’re so heavy that they shouldn’t go anywhere unless someone pulls on them – at least I hope not! 😀 This link will show you everything that I used: http://extremehowto.com/pipe-bracket-shelving/ Let me know if you have any other questions! Thank you so much. I would never have guessed how the hardware came together. Wow. I got it saved and shaping my handy Hubby!!! Great tip for the thicker wood – love that too!!!! Thank you so much. I would never have guessed how the hardware came together. Wow. I got it saved and showing this to my handy Hubby!!! Great tip for the thicker wood – love that too!!!! Love the shelves, but disappointed. I thought since this post was labeled DIY, it would give me some clue how I could replicate this look in my home. Thank you so much for the link. I honestly hadn’t come across shelving like that before, and didn’t realize there were multiple tutorials out there. Thanks again for your help. Hello! 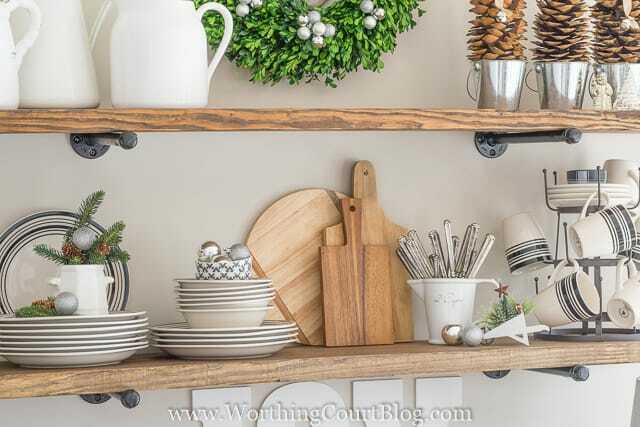 Would you please share with me where you got the industrial rustic shelves that you decorated for Christmas? Thank you! Lol… After I posted my comment, I see a gal already asked and you provided link. Thank you! I love your shelves. Adorable!! How pretty! Love rustic and glam so this is great for me! Like your Christmas decor on your shelves. Always fun to get out the greenery. You just gave me an idea. I have a darling pig’s head on one of my kitchen walls. I’m going to put a little green wreath around his neck for Christmas. I also have a stand-up big (Emil) in the kitchen. He needs to be dressed up for Christmas too! hold it right there, sister! back back! where did you get that great flatware that i can see only the handles sticking out of the darling ironstone??? i neeeeeeed them! ha! your home is one of my very favorites in blogland. keep the lovely coming…. Love how you did your shelves. I love the rustic look with other things. Now just waiting on the crackling fire and we will be ready for Christmas. Job well done as usual. Everything looks so festive!! Especially Wilbur! If you don’t mind me asking, where did you get all of the tiny little wreaths from? And do you know where I can dind some that are a good size to have on my kitchen cabinet doors? Most I’ve seen are too big for that. Thanks so much!!! Loving everything you do! Hi Candy. 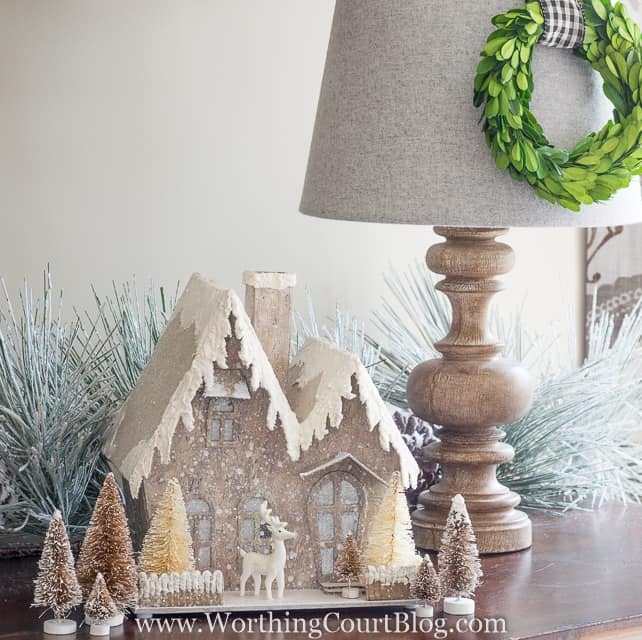 If you’re asking about the mini boxwood wreaths, you can purchase them at this link: http://www.save-on-crafts.com/wreath-boxwood-6in-round-w-ribbon.html. The link for this one is 6″ wide, but they also sell an 8″ one. If you’re asking about the grapevine wreaths that are hanging on the front of the cabinet doors, those came from Hobby Lobby. So super beautiful! I’m inspired with the shelves….wanting to do some like this in my sons room. Everything looks wonderful but I especially like the little deer under the cloche and the pinecones in the little silver buckets. Love your buffet! 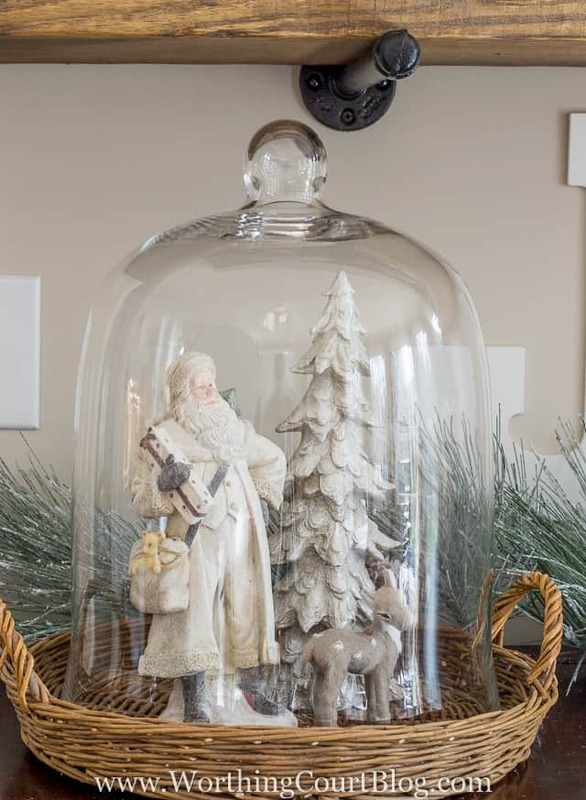 Where did you find that pretty Santa & reindeer under the glass cloche? Hi Celeste. I found them at a local home decor shop called Total Bliss. I hope you are still here as I see all your comments are from 2015 and 2016, I love the multiethnic layer cup holder. Is it available in stores? Hi Mary. Yes, I’m still here! 😀 The cup holder came from World Market and as far as I know they still have them. Hi Suzy!! I might be late….it’s 2018!!! Ha! Does the adorable lamp have a story you would tell me?? I love the whole new after shelving and stylin’!! !